Take everything with a grain of salt. Everything. Meaning, do not completely believe something you are told. This is so much infused in our lives that we almost forget about it. It comes to us naturally, to form a cognitive bias to "believe" in something, or make judgement about something as soon as information is presented to us. Rather, in this world of misinformation propaganda, we have to be careful to form opinions, because ultimately they define a person. Information: "Media reports X Prime minister involved in Y scandal"
Instant opinion: "Oh gosh, X is really unethical, I wonder what else he must have done in order to each this position, why did I vote for his party, etc etc... "
Grain of Salt: "Hmm.. Maybe media is manipulating the story. I think I need to do further research, and find out the truth before judging whatever the news is showing to me. Information: "Reports show that chocolates are actually beneficial for the teeth (and all those stupid health paradox reports) "
Instant opinion: "Hey bro, I'm going to eat 10 chocolate bars a day, and fifteen coffee mugs, and twenty burgers... I just read about it in this magazine, pretty cool man.. "
Grain of Salt: "Of course, the ways scientific communities are reporting their facts to paid magazines; like the truth is generally: Report shows that chocolates have reduced teeth infections from 17% to 14%, and for a catchy phrase they just put it differently on their headlines. What is common sense, uh"
Information: "Coworker told me, X movie sucked big time, it lacked art and substance"
Instant opinion: "No way, I'm not going for the movie "
Grain of Salt: "Can't rely solely on someone's opinions. Let me do a bit of asking around. Z told me that coworker had problems dealing with his newborn baby crying a lot in the theater, and therefore a judgement bias"
Information: "You should go for science in senior secondary, then engineering, then MBA"
Instant opinion: "I guess it is a big deal, everyone is doing it. I'll do it as well. I need the money "
Grain of Salt: "Well, there are ample opportunities in various fields. It is wrong to think that all career is motivated towards money, when I read mostly in Quora that many employees are unhappy with their jobs.. so I guess, I should rather study something that I am interested in, rather than following the herd just for money?" Information: Prettygirl_xyz: "Hey umm, can I talk to you for a while"
Instant opinion: "Wow, finally she wants to talk to me.. this is all I had wanted! Now in a day I'm going to propose her. 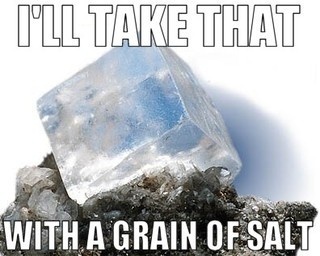 Mmmmmm "
Grain of Salt: "Wait a sec. Now all of a sudden she wants to talk to me? Based on the fact that she is really pretty, she just perhaps wants some help from me. And then I'm done. Let me approach her differently. I'll figure out if at all she likes me. No need to rush." There are countless examples, and in every moment of our lives we have to take the next step based on what we know, and based on what we infer. The second step is really important. Be it your boss. family, friend or relative: You can never be absolutely sure about something you hear. This is going to help you so much in life, that you can't imagine. Immediately you will form mature decisions, and stick by principles and opinions. People will respect you more than you've ever known. Life will be much clearer.